We had our fall open house last night, and during the "hour" my Algebra 1 parents were in the room, I was sharing with them my philosophy on graphing. Basically, that wherever, whenever possible, I want kids to use technology to make their graphs so that they can do all the state-standards-type activities: analyze slopes, make predictions, relate what's going on in an equation and/or table to the behavior of the function. I set a rule for myself last winter. "Never graph linear equations by hand." This was an easy line to draw in the curricular sand of Algebra 2 because the kinds (theoretically) already had a strong background in graphing linear equations, understanding that the coefficient of the variable was the slope, and how to articulate that between coordinate points. So there I was, about to make a grand statement to parents about how their kids were never going to make graphs by hand, and I had to stop short. I literally stopped the sentence. "I don't know," I said. "Its been a few years since I taught Algebra 1, so there are some things I'm trying to remember..."
"But, the content is easy, right?" a parent asked off to the side. "Well, yes, but I have to conceptualize it differently between Algebra 2 and Algebra 1." Is it wrong for there to be a difference, or must we always view our instruction within the context of our course/students' prior knowledge/school environment? Understanding when to re-contextualize that information and tailor it to those students in that year is what I've been learning about math instruction the last year. Lots of people can pick up math content. 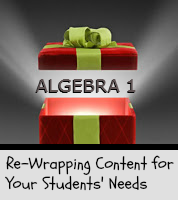 If content knowledge were most important, wouldn't a student ideally be able to teach an Algebra 1 course after they had mastered it? The first time you teach a new course (or return to one you haven't had for a few years), there's a temptation to expect that once you reacquaint yourself with the content, that the rest of the year will work itself out. Of course a master teacher is a content expert, but even more importantly, they are adaptable and flexible to make instructional design decisions that they're willing to abandon if the delivery is not appropriate for their students' context.